Butter, brown sugar, and Irish whiskey team up in this dough, which we give a long, slow bake. 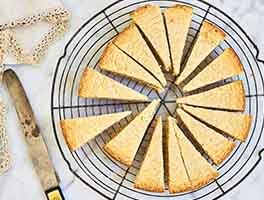 The result is a complex shortbread that ages to an even deeper flavor. 32 mins. to 38 mins. Lightly grease two 8˝ round pans, or lightly grease and flour a shortbread mold. In a large bowl, beat the butter until smooth. Beat in the sugar, salt, and whiskey (or vanilla) until smooth. Mix in the flour and rice flour. Divide the dough in half (each half will weigh about 11 ounces). Form each half into a 7˝ disk, then wrap and chill for 1 hour. Unwrap the dough and press it into the prepared pans (the mold uses half of the dough at a time). Prick the dough all over with a fork to prevent it from puffing. Bake for 32 to 38 minutes, until the shortbread is golden brown. 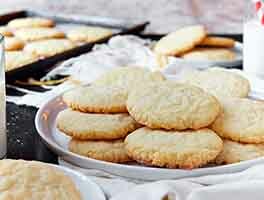 Check at 18 minutes; if the shortbread is puffing up, use a spatula to press the dough down. Continue to bake until golden. Remove the shortbread from the oven and let it cool for 15 minutes, then loosen the edges before turning over onto a cutting board. Tap the bottom of the pan to release the shortbread. Cut each round into eight wedges using a serrated knife. Store shortbread, well wrapped, for up to a week; freeze for longer storage. 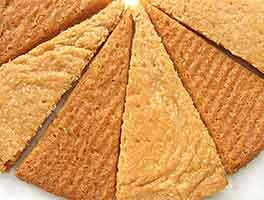 The flavor improves as the shortbread ages. This is a buttery shortbread with a carmel flavor. Do not expect that adding the whiskey will add a boozy flavor. It merely enhances the carmel. Made this recipe and made a few minor changes. The texture was okay but we found the flavour was pretty bland. We will play with the recipe a bit and see if we can get a flavour we like. This cookie tasted buttery and was very easy to unmold. With only 2 teaspoons of Irish Whiskey, my husband and I couldn't taste it at all. No matter. Chilling the dough seemed to be a waste of time, but I'll experiment more. Super happy about outcome. Used irish clover stoneware. Used brown rice flr instead of white, used homemade brown sugar, used artisan flr instead of ap and vodka and vanilla plus instead of whiskey (none on hand but still wanted dough plyability from the alcohol). Needed 40 min to cook and i pressed down at 18 min even though not very puffy because i wanted to ensure pattern printed well. Buttery and crisp. I prepared stoneware with butter and nut flour and even though 2nd time i used pan, shortbread came out easily. Delicious. Thanks! This is an excellent shortbread. I will make this again! This dough was very "short" indeed - too sandy to divide and wrap. I just chilled it in the mixing bowl for an hour and pressed the crumbs into two prepared shortbread molds. It was too crumbly to prick with a fork so I did the pricking at the 18 minute checkpoint. The result was perfect - not too sweet, very subtle Irish cream flavor, lovely texture, easy to unmold and cut. I'm VERY glad this made two pans. I gave one to a friend and kept one to enjoy! Personally I like this taste, but it gets mixed reviews from those who try it. I made it just as the recipe is using Jamison and then I made it using Irish Mist in place of the Irish whiskey. It's easy and using my celtic shortbread mold I get two pretty pans of shortbread. One to keep and one to give away. I finally made a shortbread that did not crumble when I tried to get it out of the mold! Must have been the combination of pan prep and rice flour. Shortbread is MDH's favorite - while he liked this flavor, he's a purist and asked me to omit the whiskey and irish cream flavor next time. I thought they were yummy but more importantly, I finally had a shortbread cookie in one piece!